Celebration includes idents, short-form content and Spotify partnership. Eurosport is marking its 30th anniversary today (5 February) with a series of initiatives looking back to 1989, the year in which it was first broadcast. The brand has created a bespoke identity to run across linear TV, digital and social channels in the form of idents, pre-title sequences and promos that celebrate the sports stars of 1989. It has also commissioned a series of short-form films inspired by the year, revisiting some of 1989’s key sporting events. 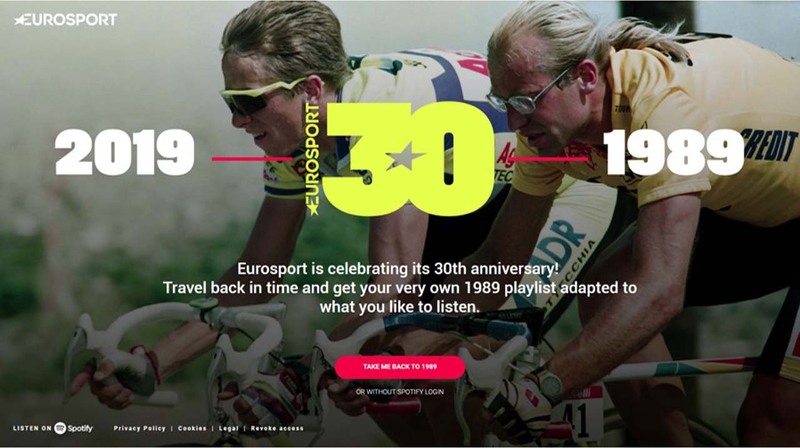 Eurosport has also partnered Spotify to launch a 1989-themed playlist, microsite and digital ad campaign that will run until the end of the month. The collaboration will allow users to create their own playlist of music from 1989 matching their own tastes. The channel was launched on Sky on 5 February 1989 and, in its first month, covered events including the World Alpine Skiing Championships, World Matchplay Snooker, the World Bobsleigh Championships and the European Figure Skating Championships. JB Perrette, president and chief executive of Eurosport owner Discovery International, said: "Eurosport has been dedicated to sport for 30 years and continues to innovate and disrupt the market – proving itself to be a pioneer of the sports industry time and again. "From our game-changing Olympic Games partnership, position as the home of cycling, Grand Slam tennis and winter sports, and operator of the only European-wide OTT streaming service, the Eurosport Player, Eurosport continues to be a unique proposition for sports fans across the continent."